In this lesson, we hope to clear up whether or not you should be wearing your wedding rings— and to know what to do. Please find your marital status below and return to this page each time your status changes during your Restoration Journey. Are you LEGALLY MARRIED, and you are living with your husband? If you are currently living with your husband and you are legally married, we encourage you to keep wearing your wedding rings. If you have taken them off because of how you felt, because you were hurt or angry or for any other reason, we encourage you to begin wearing your wedding rings again. If you are married you should only remove your current wedding rings IF your husband tells/asks you to remove them since—a wife must be subject/submissive to her husband in everything. God is not impressed when you are not subject to your husband, when you are legally married. Yet always make sure you are being subject or submissive as "unto and as fitting to the Lord." If you submit due to worshiping your husband and wanting to please him, not for the sake of pleasing the Lord, you will continue to damage your restoration. Let me share my testimony with you when the Lord showed me the significance of wearing wedding rings, when to remove them, and the rest of what I have shared. At one point, due to being hurt when my husband told me he didn't love me and never did, I stopped wearing my wedding rings. But then the Lord told me that the rings were meant to be worn due to the vows I took before HIM. So I put them on and determined to wear them again. I stopped caring what my husband would think or feel, I was doing it as unto the Lord. Then as you all may know my husband divorced me. Due to not getting the final papers I wasn't sure he went (because I didn't go but "lost" by default*), so to be sure (due mostly to the concern about intimacy if the divorce had gone through I could no longer be intimate) I asked. When he said yes, I wasn't sad at all! I was elated because two weeks prior to the court date, the Lord did the impossible and provided NEW rings for me!!! So, rather than having my bubble burst, I excitedly excused myself and went to my jewelry box to put on the rings I was so eager to wear because then I knew I was all His, my new Husband. Surprisingly, my (now ex) husband followed and asked about the rings. I told him I got them should the divorce go through and was wearing them as a symbol I was not available to any other guy (not even to him, but I didn't say that). He took my hand and stared at it and then looked at his ring I just took off almost like he was going to cry. Had this been a big show I was putting on, I know what would have happened, I WOULD have been the one who ended up crying, but not this time! And when we finally did remarry I got a REAL diamond ring, not the CZ fake one that my husband proposed to me with, that represented a fake and loveless marriage. *When I said I "lost" by default, as you can see that's when I won and when you will win too!! "For whoever wishes to save his life will lose it; but whoever loses his life for My sake will find it" —Matthew 16:25. Are you SEPARATED, no longer living with your husband? If you are currently separated, but not divorced, we encourage you to keep wearing (or begin wearing) your wedding rings. 1. You should remove your current wedding rings IF your husband tells/asks you to remove them since—a wife must be subject/submissive to her husband in everything as I said above. HOWEVER as I said to the married women above— always make sure your reasons for being subject or submissive is as "unto and as fitting to the Lord" because He is the one you want to please. 2. You should also REMOVE your wedding rings IF/WHEN your separation turns to divorce, not just filed, but once the divorce goes through. Let me share my testimony with you when the Lord showed me the significance of wearing wedding rings, when to remove them, and the rest of what I have shared. At one point, due to being hurt when my husband told me he didn't love me and never did. But then the Lord told me that the rings were meant to be worn due to the vows I took before HIM. So I put them on and determined to wear them again. I stopped caring what my husband would think or feel, I was doing it as unto the Lord. *When I said I 'lost" by default, as you can see that's when I won and when you will win too!! Rings can be a powerful symbol. Unless your husband has made a point of asking you to take off your rings, if you're still legally married, even though you're separated, you should be wearing them. Has a Divorced been Filed by you or your husband? Once you find out you are no longer legally married, we strongly encourage you to remove your wedding rings. It doesn't matter if you never had rings, or if you took your rings off because you were hurt or angry or for any other reason. Once you are NOT legally married, we encourage you to remove your rings, which will leave room for the Lord to provide rings for you as you will read below. It's Time to Remove Your Rings! 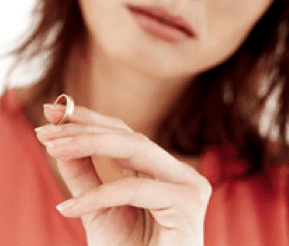 Even if you're believing for restoration, once a divorce goes through, it's time to remove your rings because to keep wearing them is not only deceptive, but it also is a clear sign to everyone—especially your husband—that you refuse to LET GO. And not letting go poses many serious consequences, as you will learn in a future lesson to help RENEW your mind. The Lord wants you all to HIMSELF as HIS bride! “'Fear not, for you will not be put to shame; and do not feel humiliated, for you will not be disgraced; but you will forget the shame of your youth, and the reproach of your widowhood you will remember no more. And there is even more FANTASTIC news for each of us who has been forsaken—the Lord will also faithfully provide NEW wedding rings for you to wear! Rings can be a powerful symbol and this means if you're divorced, you NO LONGER should be wearing the wedding rings your husband gave you—since others will be watching and—it's going to speak volumes to EVERYONE. Take them off, then get alone somewhere and ask your heavenly Husband what to do about wearing HIS rings. If you are no longer legally married, but divorced, we strongly encourage you to remove your wedding rings. When I said I 'lost" by default, as you can see that's when I won and when you will win too!! Are you legally Divorced and your husband has Remarried? Since you are currently DIVORCED, and are no longer legally married, —especially since your husband has remarried—we strongly encourage you to remove your wedding rings.It doesn't matter if you never had rings, or if you took your rings off because you were hurt or angry or for any other reason. If you are currently NOT legally married, we encourage you to remove your rings, which will leave room for the Lord to provide rings for you as you will read below. For YOUR Husband is your Maker, Whose name is the LORD of hosts; and your Redeemer is the Holy One of Israel, Who is called the God of all the earth." As I was watching the Be Encouraged Classic e-video 1 part 3, which is part of the RYM and Refresher courses, Erin was speaking about wedding rings. This reminded me I needed to send in this a praise report about what He did to provide me a ring! My EH and I never used our rings much, I lost mine years ago and it was never replaced. But after coming to RMI and learning the importance of showing we aren’t available to others, I began to pray and ponder buying one. I tried on several cheap ones from a department store and they weren’t comfortable. After my divorce, I began seeking Him again for a ring, to show others I wasn’t available, because I am His and His alone. One evening I was passing by a jewelry store and felt an urge to go in, I dismissed it and went on with my business thinking it would be a way too expensive option. When I passed by the second time, I again felt the urge to go inside. I went in and looked, the sales lady asked what I wanted and I simply stated that I had lost my ring. I felt a check in my heart so I then explained so she could understand that I had been recently divorced, but just wasn’t available. She immediately liked the idea and was happy to show me the plain wedding bands I was looking for and they were in my budget! I tried on one and was surprised at the perfect fit, and to boot it was a “comfort band” that didn’t even feel like it was on my finger! I felt Him smiling and approving :). As I paid, I was surprised as she put it in a beautiful ring box and then in a pretty gift box and bag. I felt so special, like I was getting a gift! As I left the store grinning, I couldn’t resist looking at it again. So following another urge I went down a little path walled in with flowers and palm trees and with little white lights along the way. I was suddenly in a very “romantic” area. I found a little bench tucked in amongst the flowers and sat down and took out the gift box, then opened my ring box. The glint of the lights on the pretty silver band took my breath away, and suddenly I felt so loved. A romantic song was being piped softly over the sound system and as I put on my ring, I began to cry. I suddenly was pouring out to Him the wedding vow. I promised that I would always cherish and obey Him, and never leave Him. I felt such love in my heart, like a warm hug from Him. I got up and was so happy I felt like I was floating. I went home, laughing, crying and praising Him. He gave me more than just a ring to wear it is now a symbol to me of that vow I gave Him!! And more than that, the ring was not only my vow to Him but a symbol of His love for me. He loves me and His love is not conditional nor does it have limits!! It is on my finger always, and if I take it off to do dishes, I feel uncomfortable without it! I feel so cherished and honored to get to wear it. It is far more than what I planned for, but that’s just like Him!! Ladies, He loves each one of us more than we know, He longs for us, and cherishes us. Be Encouraged!! This journey just gets better EVERY DAY! My HH has done something so very wonderful for me!! Let me explain! I am Divorced, but not Single, and I am never alone :). Over the last several weeks I've been doing some refreshing in my RMI Courses. I finished them for the first time a while ago, actually in early 2012, but over the last few months I had been sensing the Lord wanted me to do them again. Then suddenly I was given the invitation to take a "Refresher"! PTL that He led me to do this again, otherwise I would have missed something so very important! One of my fellow Ministers recently sent in a PR about her NEW RING her HH gave her, "My New Ring". I was so happy for her while reading it and I could feel her JOY!! It was amazing ;). I didn't clue in at that moment while I was reading it, but my HH wanted to do the same for me!!! Then last week while viewing Erin's Be Encouraged videos again, she said in the video, "HE WANTS TO PUT HIS RING ON YOUR FINGER". At that very moment my heart took a LEAP and I realized He was speaking directly to me!! I knew right there and then that I was going to get a NEW RING! (I'm giggling as I write this because HE IS SO WONDERFUL AND HE MAKES ME LAUGH!) I thanked Him and knew HE would buy it for me since I was flat broke!! Oh ladies, let me tell you, He is the most Wonderful BRIDEGROOM! Embrace Him!! So, yesterday after returning to work from my lunch break, this was so "unexpected", I had an envelope waiting for me and in it was a $300 bonus check from my employer! My heart took another LEAP! I was so overcome by His LOVE for me at that moment and just knew this was the money He provided for MY NEW RING!! I left work that day and headed straight to the jewelry store with My Husband leading me! Now placed on my ring finger is a brand new White Gold Wedding Band with 11 Beautiful Diamonds :))). The cost of my beautiful ring and the purchase of the LIFETIME WARRANTY with it was just under $300, then He bought me a nice dinner :)!! He is so SWEET! I am HIS BRIDE, He is my BRIDEGROOM!! !